Auckland Coal Action demonstrated outside Fonterra’s head office in Auckland yesterday against the company’s continued reliance on coal-fired boilers at its dairy factories around the country. The protest caught the eye of passers-by, many stopping to take photos of Fonterra’s “climate ambassador”. Fonterra, New Zealand’s second largest coal user, claims it will quit coal, but its progress to date is much to slow. Its current targets of “no new coal boilers installed from 2030”, and a 30% emissions reduction by that date, are way too slow to protect us from the serious consequences of climate change. No new coal-fired equipment to be installed. Existing coal-fired boilers to be steadily phased out and replaced with alternatives using sustainable fuels. IPCC target of 67% reduction in coal emissions by 2030 to be adopted and complied with. We need action starting right now, not in 2030. Delegates from the AusIMM (Australasian Institute of Mining and Metallurgy) conference were taken on a field trip to Rotowaro and Maramarua (K1) mines on Sunday 16 September. At both venues they were met by protesters with the clear message that the coal must be kept underground for the sake of the climate. This action was a joint effort between Auckland Coal Action, Coal Action Network Aotearoa with support also from Auckland Peace Action and Auckland 350.org. The conference is being held in Tauranga on Monday and Tuesday of this week. A herd of bellowing cows have joined a protest on busy Fanshawe St today, outside Fonterra’s Auckland Office, calling for it to stop sitting on the fence with regard to climate change, and to start taking urgent action to reduce its climate-wrecking emissions from coal burning. Protesters are from Auckland Coal Action, and other local groups that are highly concerned. Fonterra presents itself as an environmentally friendly business and has joined the recently-formed Climate Leaders Coalition business group. But Auckland Coal Action spokesperson, Peter Whitmore, says that, based on available information, New Zealand’s second largest coal user still has not taken any meaningful steps to reduce its emissions by switching to sustainable fuels or to other processing methods in its major dairy factories. “It is essential for industry to do its part so that this country can meet the internationally agreed Paris objective of holding global warming to under 2°C, and preferably to under 1.5°C”, says Whitmore. “Fonterra needs to step up by urgently phasing out all its coal-fired boilers, with the aim of none being operational after 2025 and definitely not after 2030”, he says. This is a challenge, but the assessment of his Auckland Coal Action group and others is that it is achievable, if Fonterra starts right now. This is also a challenge that Fonterra must not shirk as we are already seeing serious impacts of climate change occurring globally. Auckland Coal Action members did street theatre today outside Fonterra’s Fanshawe St headquarters in protest against Fonterra’s increasing coal use in their factories. Fonterra now burns more coal than Huntly Power Station.The group says Fonterra’s claims of sustainability are greenwash. To illustrate this they painted “Fonterra Stop the Greenwash” on a giant pair of bloomers. Fonterra relies heavily on coal in its dairy factories, despite the very high greenhouse gas emissions this fuel produces. “Scientists are now saying that coal has to be phased out as early as 2030, and that no new coal-fired power plant should be built – from today,” said Geoff Mason of Auckland Coal Action. Fonterra is planning to building more coal-fired dairy factories, and a new coal mine has been opened in the Waikato to help meet the company’s ongoing coal demand. He noted there was enough wood waste from forestry operations in New Zealand to power many of Fonterra’s factories. This fuel is now commonly used in Europe and Canada to fuel industrial boilers. It is almost carbon-neutral because re-planted trees absorb the CO2 produced. Fonterra also has other sustainable alternatives. Images from Auckland Coal Action’s inspection of the Kopako 1 mine, near Maramarua. A group of eight activists from Auckland Coal Action, many of them grandparents, today carried out an inspection of Solid Energy’s Kopako 1 coal mine in the Waikato to protest its redevelopment, and left a climate change message for the company. The mine, near Maramarua, in North East Waikato, has been dormant since the 1990’s, but Solid Energy has now begun work to revive it. The team confirmed after walking into the site today that not only has overburden been removed, but coal mining from a seam has begun. 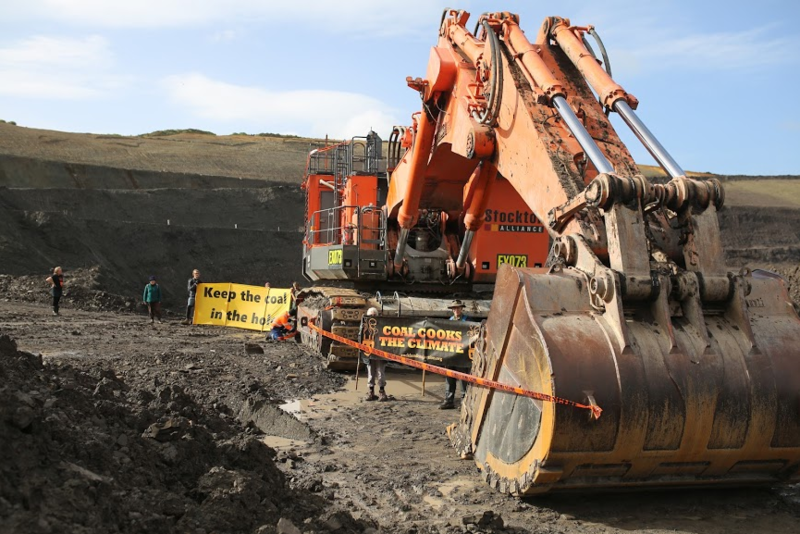 “Solid Energy is undertaking extensive development of this old coal mine, despite having no customers for the coal, and the international industry being in terminal decline,” said one of the activists, Geoff Mason of Auckland Coal Action. “Meanwhile, the Government has signed the Paris Agreement which means that we have to get out of coal by 2050, globally, which means coal like this has to stay in the ground. The team walked into the mine site, and spent around an hour at the coalface, wrapping a excavator in “climate crime scene” tape confirming that new mining has removed the overburden and is now digging up coal. They deployed signs and banners, before leaving again. Among the activists who inspected the mine today was Phil, a great grandparent. “I am seriously concerned about a climate changed future for my five great grandchildren – this is why I am here today, to tell Solid Energy and the Government to stop wasting taxpayers’ money, and keep the coal in the hole,” she said. Auckland Coal Action is also concerned that one of the potential customers for the mine could be Fonterra, the country’s second-largest user of coal. 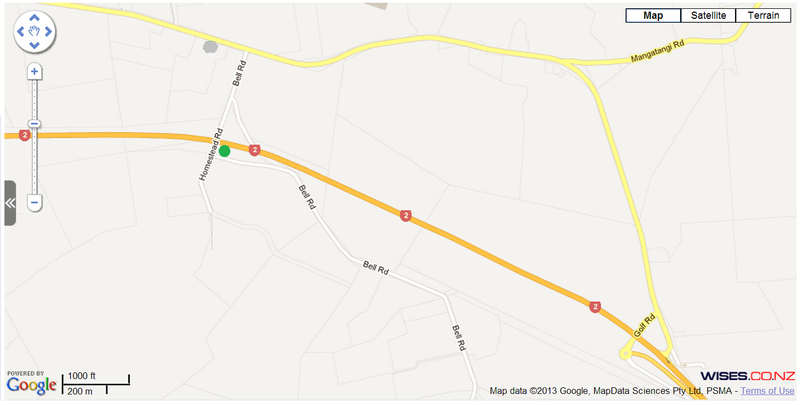 Fonterra was planning to open its own coal mine at nearby Mangatawhiri, but has put those plans on permanent hold. “Solid Energy might be eyeing Fonterra as a potential customer, but Fonterra should be looking at changing its energy source to renewable wood and biomass rather than coal,” said Geoff Mason. Photos of the day in this post. Fonterra has indefinitely deferred opening of it’s new coal mine at Mangatawhiri, however we believe it plans to purchase coal from Solid Energy’s nearby Kopako coal mine, currently closed but soon to reopen thanks to Fonterra. Auckland Coal Action says Fonterra should start switching their boilers to renewable, environmentally-friendly biomass sources such as wood waste. This Auckland Anniversary Monday we will be back at Mangatawhiri (only 45 minutes from the CBD) to make thousands of motorists returning to Auckland aware of the mine and increase pressure on Fonterra to keep it closed and clean up their act.